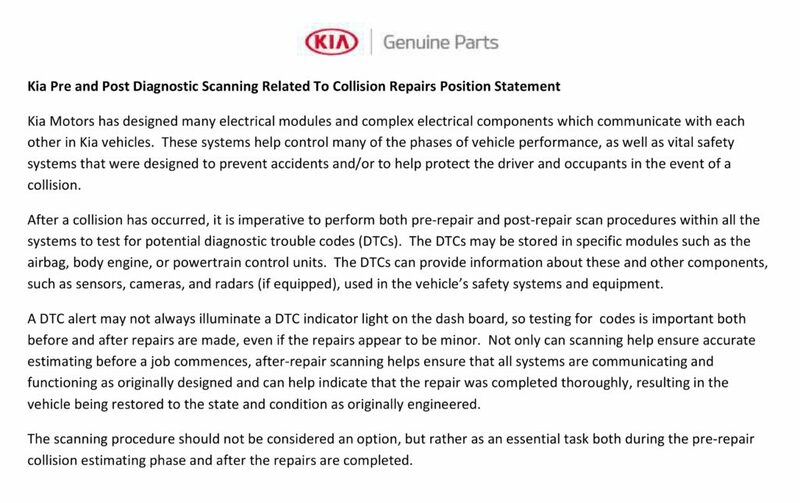 Kia has released a position statement warning shops that they should consider scanning a vehicle before and after a repair “an essential task,” the latest OEM to confirm the need for the operations. Sister automaker Hyundai already released a similar position statement in March. 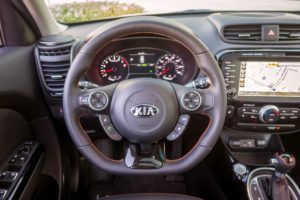 “The scanning procedure should not be considered an option, but rather as an essential task both during the pre-repair collision estimating phase and after the repairs are completed,” Kia wrote. It’s likely the June Kia statement just reinforces what shops and insurers should have already known from reading Kia OEM repair procedures. But it probably offers wake-up call to the repairers and carriers who haven’t done so. The nontechnical language also might make it a good resource for shops seeking to convey the importance of the procedure to customers and less informed adjusters. Kia Motors has designed many electrical modules and complex electrical components which communicate with each other in Kia vehicles. These systems help control many of the phases of vehicle performance, as well as vital safety systems that were designed to prevent accidents and/or to help protect the driver and occupants in the event of a collision. After a collision has occurred, it is imperative to perform both pre-repair and post-repair scan procedures within all the systems to test for potential diagnostic trouble codes (DTCs). The DTCs may be stored in specific modules such as the airbag, body engine, or powertrain control units. The DTCs can provide information about these and other components, such as sensors, cameras, and radars (if equipped), used in the vehicle’s safety systems and equipment. A DTC alert may not always illuminate a DTC indicator light on the dash board, so testing for codes is important both before and after repairs are made, even if the repairs appear to be minor. Not only can scanning help ensure accurate estimating before a job commences, after-repair scanning helps ensure that all systems are communicating and functioning as originally designed and can help indicate that the repair was completed thoroughly, resulting in the vehicle being restored to the state and condition as originally engineered. collision estimating phase and after the repairs are completed. Shops and insurers might also want to take this new position statement as an opportunity to refamiliarize themselves with Kia’s 2017 position statements on aftermarket parts, recycled parts, remanufactured parts, and aftermarket and recycled safety restraint systems.